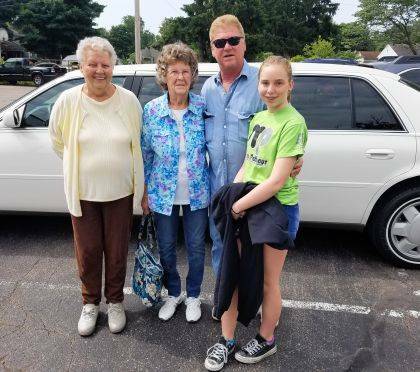 It was a day of riding in style on June 7 as Carolyn Miller and friends traveled by limousine to Der Dutchman restaurant in Plain City for lunch. Miller won the free limousine service as part of Walter & Lewis Funeral Home’s drawing at Senior Citizens Day in May at the Champaign County Fairgrounds. Pictured are Miller and her friends Veda Jackson and Chuck and Sara Maddy. Chuck Maddy was also celebrating his birthday.